The big electric pole is an improved electric pole. It is a more specialized variant compared to the medium electric pole, offering the longest wire reach of all of the electric poles, with the trade-off of a very short supply area. Because of this, big electric poles are ideal for long-distance power lines, as they require the smallest number of entities to be placed to span a given distance, but generally unsuitable for providing local coverage to groups of structures. Visualizations of Area of effect when hovering on pole. Further optimization on building while holding mouse down. Poles now auto-connect to all poles in reach with no common neighbor. 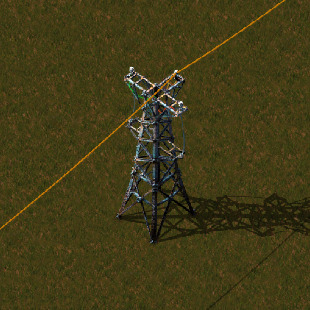 Building electric poles with shift pressed builds it without any connections. Max wire distance between poles is limited to the smallest pole's when manually connecting. Shows what is connected to the electric pole when selected.